Capture a visitor’s email and build up a subscriber base of 15,000+The way you capture email addresses is to ask for them! I think we’ve all seen websites asking you for their email to join up to their newsletter. The great thing is around 1 in 7 people do volunteer their email. Especially if you can promise them something in return. You’ve got to give them something in return for them giving your email. A free report, piece of software a document or whatever. I create a report in MS Word then convert it in to PDF to make it look professional. Put headers and footers in to the word document to make it look pretty then convert to PDF. Try and think of what would be useful to your visitor that you could create. It could be your top 10 tips on….., the best places to find…., the 7 steps to….., etc and then offer it as a free gift in return for their email. I create what’s known as a hover ad that drops down after 5 seconds the reader has been on my site. A hover ad is like a pop up add that cant be blocked. It pops up after 5 seconds so this gives the reader some time to get an idea about my site. If they clicks away before 5 seconds then they would never be interested in giving me their email. If they stay longer than 5 seconds then its possible they would. So this eye catching advert will drop right in front of them while they are reading. Now some people find this annoying but most don’t. Especially if they are interested in your subject. They will look at your offer and think they could do with that report and since all they have to do is give them their email then it seems a fair trade off. My research has shown 1 in 7 people are willing to do this if your offer is compelling enough. Once created you click on generate code and copy and paste both parts of the HTML code in to your home page. The way you do this is to go to the home page text editor as if you were going to edit the text of the home page, click on the icon that looks like ‘<>’ and then paste both bits of code at the top of all the code. Then click ‘Save Page >>>’. The JOIN NOW is a hyperlink to a sign up page which you create in the website creator. To do this you need to create a sign up page first. A subscribe box will appear with text entry fields for their first and last name and their email. That’s it. You now have your sign up page. It will be called www.yoursite.com/newsletter-sign-up.html and this is what you have as the hyperlink for the “JOIN NOW” part of the hover ad in part B. Then click on the icon that looks like a paper clip that says “insert file” if you hover over the icon. Now when someone signs up they will be sent an email confirming that they have been added to your mailing list and there will be a hyperlink where they can download your free report. Now it took me around 6 months to build a subscriber database of 17,000 and since then it has hovered around this number as the same amount of people subscribe as well as unsubscribe. This is because the website creator allows the subscriber to unsubscribe at anytime with one click (to comply with spam laws). So my list stays at a healthy 17,000 ish. I do not know how long it will take you to build such a list. I think my list grew very fast as its quite a popular subject. You may even grow one even faster than me you just don’t know. The great thing is a hungry list = lots of money. This is because they come back to your site clicking all over the place. You will understand as I go on. I want you to read the above title very carefully. I am not saying to send them an email for your subscriber to read. I am asking you to send your subscriber an email which encourages them to click again back to your website. There is a distinct difference. I see many newsletters that come straight in to your inbox and they are all there to be read. You need not click back to the site as they have given you all the information right there in the email message. I want the subscriber to read my email message and click back to my site. The best way to do this is to always put the subscriber’s firstname at the start of the email subject. The way you do this is to put [[firstname]] at the start of the email subject line and the website creator will substitute [[firstname]] with the subscriber’s firstname which they told us when they signed up. Because it addresses the person directly, namely John, and it tells you that we have found out 7 ways you can save on your tax bill. This is a lot better and more likely to get opened compared to “find out more about your tax bill”. I hope you can see why. Hi [[firstname]],Did you know [[firstname]], one of my friends was about to submit their tax return when I said let me have a look at it. I was amazed at what his accountant had left out. I made 4 simple adjustments and saved him £3,487 and I t only took me 4 minutes to do! So I would use the [[firstname]] substitution a couple of time and then tell a bit of the story but leave most of it out leaving them hungry to find out about the 4 adjustments that only took 4 minutes. So I would tell them exactly where to click if they wanted to find out more. Do not just put your link as sometimes people just scan read and will not understand to click on that link to find out more. Also only include one link per email message as not to confuse the reader. And don’t forget to include the http:// before the www. As the link will not work. So all the way along I am enticing them to open further. Firstly to open the email message and then open the page where the newsletter is displayed. If you manage to do this then your on the way to making some money………the next part is crucial. Once they arrive at the newsletter you’ve got to promise to deliver what you have promised otherwise they will not open up any further newsletters from you. 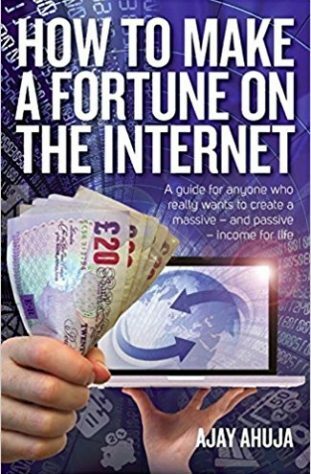 You also need affiliate links (which are links that once clicked you potentially get paid on) and adverts (which you get paid on every time some one clicks on them). Affiliate links which are related to the article. So in my example I have spoken about tax so I will have affiliate links about tax, accountants, tax savings etc that I have signed up to. Please see chapter 7. Adverts which are displayed by Google. Please see chapter 6 below. To see an example of my newsletter with affiliate links and adverts on please visit www.ahuja.co.uk and you will see my daily newsletter.